Ambulyx ochracea Butler, 1885, Cistula ent. 3: 113. 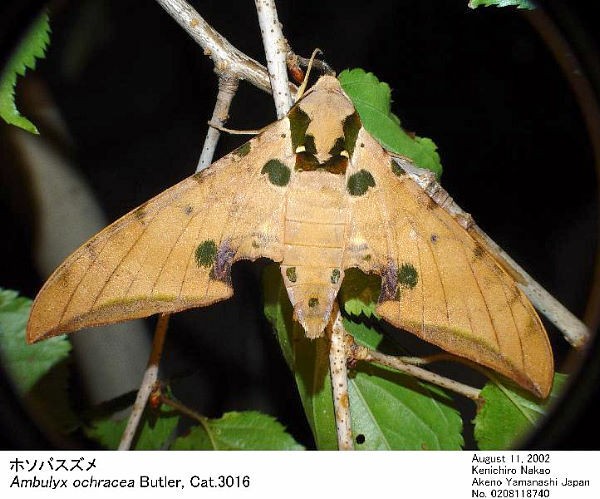 Type locality: Japan, [Honshu, Tochigi,] Nikko. Wingspan: 85--114mm. 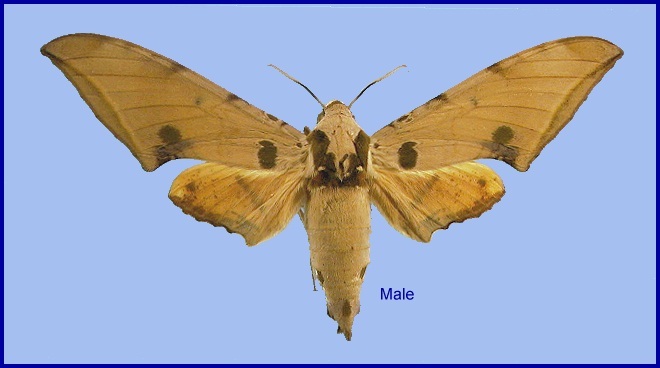 Both sexes without a dorsal line on abdomen, but the male has a patch on the eighth tergite. 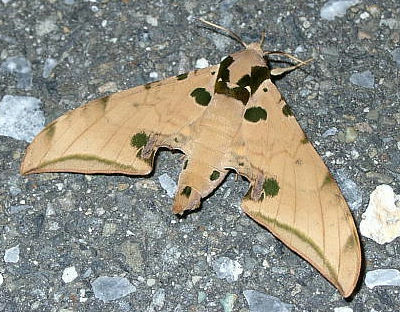 The posterior subbasal patch of forewing very large, larger than the costal patch. The male is the most uniformly yellow species of the Indo-Malay Ambulyx; the female is darker than the male (Bell & Scott, 1937). In India, Bell & Scott (1937) caught a specimen at rubiaceous flowers along with a female A. sericeipennis. This indicates that these two species feed as adults. China: ii (Guangdong); 31.v-2.vi (Guangdong); vi (Yunnan; Hong Kong; Hubei); vii (Hong Kong; Yunnan); viii (Fujian); xi (Yunnan); xii (Guangdong). Taiwan: iv-v (Kaohsiung Hsien; Hualien Hsien). Japan: 7.v-10.viii (Honshu); 9.v-10.vi (Yakushima); 15.v-23.vi (Shikoku); 12.vi (Kyushu); 29-30.vii (Tsushima). Park et al. (1999) give late April until mid August as the flight period in Korea, with two generations being evident. OVUM: Pale green, oval (1.20 x 1.57mm), smooth and shiny. LARVA: Full-fed 59--70mm. 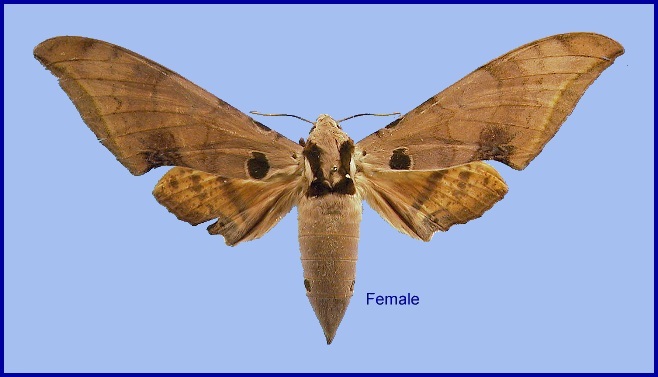 According to Bell & Scott (1937), in the first instar head broader than body; horn short, straight, tip broadly bifid. Head brownish, body greyish-green, set with fine bristles of the same length on each segment. Horn black with the base shortly reddish-brown. In the second instar the head is broader and higher than segment 2, without processes on the vertex. 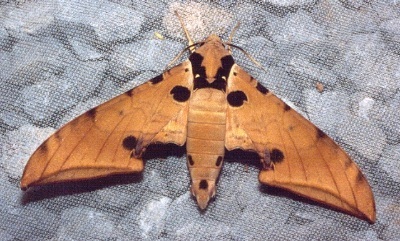 The body is dull brownish-yellow, the horn straight, reddish brown, the broadly bifid tip black. 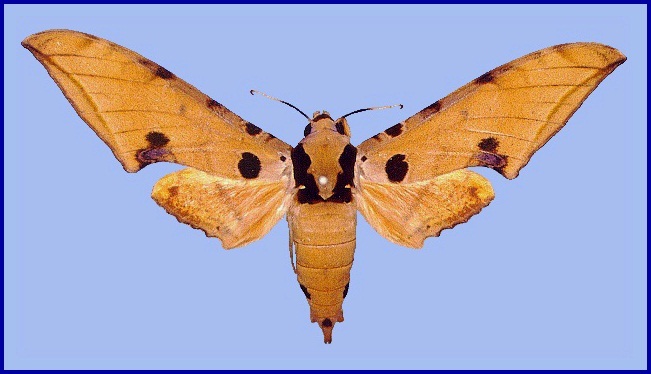 In the fifth and final instar, shape as in others of the genus except that the horn is slightly up-curved. Surface smooth, the transverse rows of tubercles very low. There are very small white tubercles on the ventral surface. In colour, the head is greyish-green with a whitish line on each side of the dorsal line from the vertex to apex of clypeus, and with a white cheek-stripe. A small orange-coloured tubercle adorns the apex of each lobe, and a whitish subdorsal stripe extends from each tubercle to the nape, joining the subdorsal stripe of the body. Apex of clypeus reaching to two-fifths length of head. Body yellowish-green above the spiracular line, greyish-green below it. There is a white, clearly defined subdorsal stripe on segment 2, becoming yellow dorso-laterally, and less clearly defined on the posterior segments. A narrow, yellow, subspiracular stripe extends from the front margin of segment 2 to hind margin of 4, where it meets the oblique lateral stripe on 5 at its lower end. In total, there are seven yellow oblique lateral stripes, on segments 5 to 11. 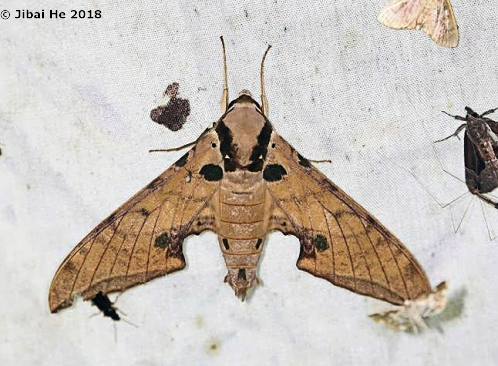 On the median segments the angle between the oblique lateral stripes and the dorso-lateral stripe is filled in with pale violet triangular patches, these patches often bordered with rusty-red or rusty-brown colour, which may spread so as to cover the whole body excepting the triangular patches. 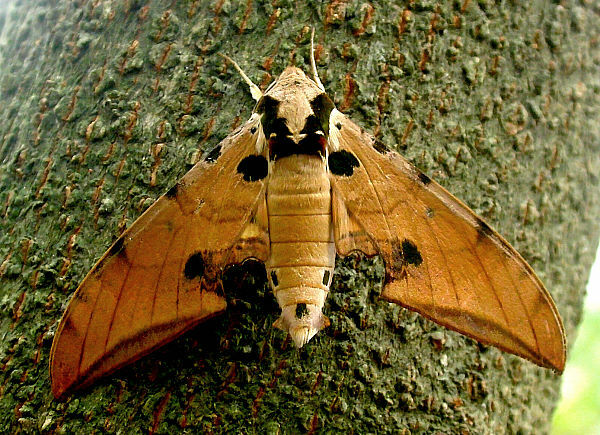 Spiracles oval, yellowish-grey with a reddish tinge, the central slit shaped like a candle-flame and dark greyish-brown. PUPA: 36--48mm long, 12mm wide. In shape the same as in others of the genus. Surface superficially shagreened, especially on the dorsum. Sculpturing on segment 4 consisting of a transverse subdorsal raised line, the two lines sometimes meeting dorsally, where they form a short shiny streak. Cremaster longer than broad, flat dorsally and finely rugose, the tip a transverse shortly oblong piece with a small bristle or tooth at each lateral corner. Larval hostplants. Juglans regia in China (Wang, 1990); however, Bell & Scott (1937) give Choerospondias fordii (as Poupartia fordii) (Anacardiaceae) for India. China: Beijing (Baihua Shan); Jiangsu; Anhui (Mt. Huang Shan); Zhejiang (Ningbo); Hubei (Mt. Guifeng, Macheng); Sichuan (Baoxing); Chongqing (Simianshan); Yunnan (nr. Yingjiang, 1180m; Mengla County, Mt. Leigongyan, 2000m; Pu'er/Simao; Gaoligong Shan); Hunan (Dayong); Jiangxi; Fujian (Guangze, 1200m; Longqi Shan); Guangdong (Longtou Shan; Nanling National Forest Park, 1100m); Hong Kong. Taiwan: Hualien Hsien (Taroko National Park); Kaohsiung Hsien (Shanping, 640m); Taipei Hsien; Nantou Hsien (Renluen, 1400m). South Korea: Baengnyeong-do & Daecheong-do; Seoul; Kyonggi Prov. (Suri-san; Gwangleung; Jugeum-san; Cheongpyong; Myungji-san; Soyo-san; Guleop-do); Kangwon Prov. (Daeryong-san; Gwangduk-san; Seolak-san; Bangtae-san; Chiak-san; Baekduk-san; Jodong-ri; Chuncheon; Bongmyung-ri; Jiam-ri; Jeombong-san; Wonju; Hongcheon); North Chungchong Prov. (Hwayangdong; Chupungryung; Youngdong; Jecheon); South Chungchong Prov. (Gyeryong-san); North Cholla Prov. (Daedun-san; Jiri-san; Namwon); South Cholla Prov. (Baekyang Temple; Jin-do; Gwangyang; Gurye); North Kyongsang Prov. (Sobaek-san; Naeyon-san; Juwang-san; Ulleung-do; Cheongyang-san); South Kyongsang Prov. (Gibaek-san; Jinyang; Yeohang-san; Jinju; Geoje-do; Namhae-do; Goseong; Sacheon; Sancheong; Ulsan; Tongyoung; Hadong; Hamyang; Hapcheon); Cheju Prov. (Cheju-do; Sunheul; Halla-san; Topyang; Gwaneum Temple; Ora-dong; Andeok; Suakbong; Sungpanak). Japan: Honshu (Kobe; Nashimoto; Mikaboyama, 750m; Shinbo; Bushi; Izu Peninsula; Miwamachi; Kawasaki; Nikko; Tokyo; Yokohama; Kyoto); Shikoku (Shioemachi); Kyushu (Nagasaki; Fukuoka); Tsushima (Sasuna); Ryukyu Archipelago (Yakushima). From Nepal, Sikkim (India), Assam (India) and Bhutan across central and southern China to South Korea and Japan, and south to Thailand, northern Vietnam and Taiwan.